Resin guide | Products | Tokyo Hatsujyo Manufacturing Co.,Ltd. 1. 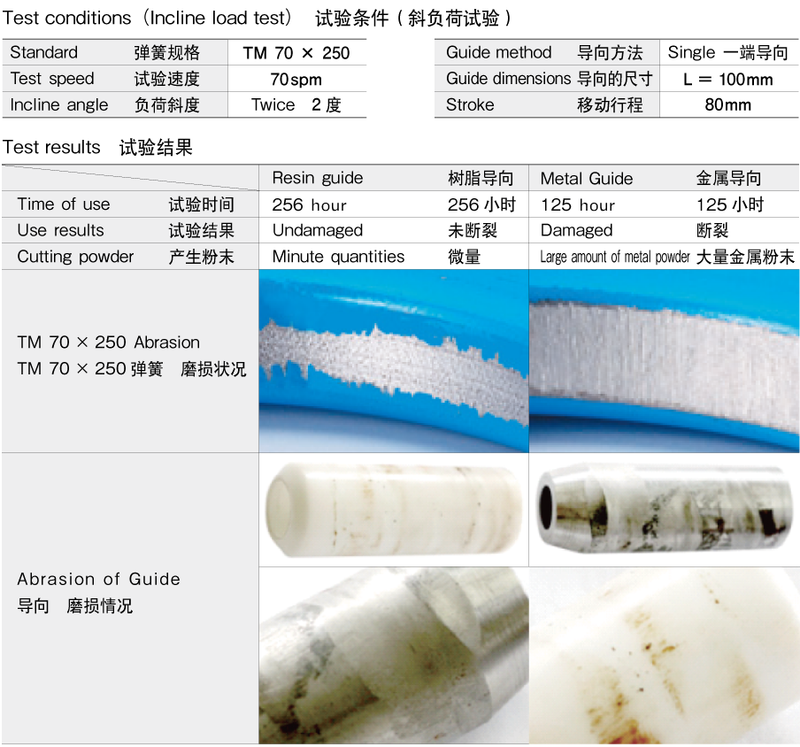 Resin guide has softer steal than spring steel, by that there is lubrication within the resin guide prohibiting the formation of harmful scratches that can cause breakage in the spring inner diameter. ：2. Resin guide allows prevention of damage to the springs, it is also possible to hold the shot peening effect to maintain the durability of the spring itself. 1. Materials and working temperature tange. When exposed to ultraviolet rays for a long time, a crack and choking occurs on the surface. Please store or use it avoiding direct sunlight for a long term. One of the characteristic of POM is excellent chemical resistance. However please take note that it dissolves in hexafluoroacetone hydrate etc at room temperature or in γ-butyrolactone etc at high temperature. POM has strong resistance to household chemical. So there is little harm. There is some case that its color will be changed by chemical reaction of synthetic detergent and additive in POM. However it is no influence strength. It is necessary to take note that POM may be affected by an additive of the grease. POM has excellent resistance of various chemical related automobile. However, it may be affected by additive of battery liquid, gasoline, or lubricant. And please take note that POM may be bitten by acid which occurs by a medicine being oxidized, when it is used at a high temperature for a long term.